You might not know it, given Will & Kate & Co.’s primacy in English-language media, but there are European royal families besides the Windsors. For instance, the Swedish house of Bernadotte, which includes a princess who was once a reality TV star. That would be Princess Sofia, married to the comically dashing Prince Carl Philip (number four in the line of succession, behind his older sister and her kids). She gave birth to their first child, Prince Alexander, in April. And we really don’t talk about this bunch enough. Even Kim Kardashian hasn’t been able to parlay her media dominance into a royal title! Please take a moment to respect the hustle! 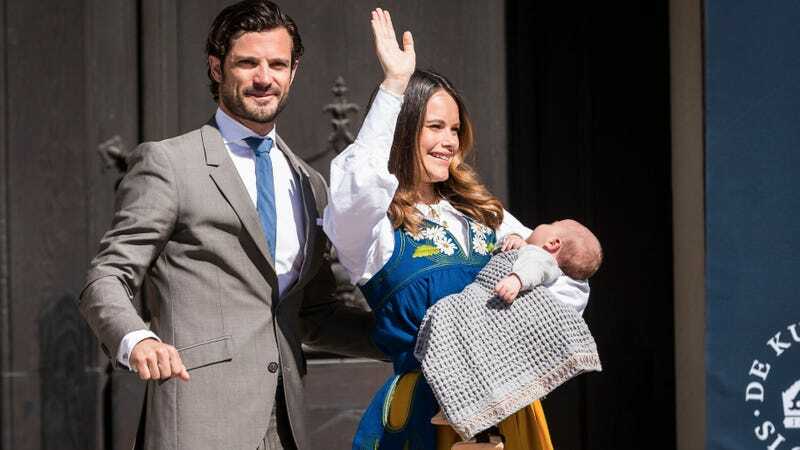 At any rate, People reports that the pair trotted out their seven-week-old offspring today for his first public appearance, in honor of Sweden’s National Day. Which, as you can see, means that Sofia wore some very jaunty traditional Swedish dress. Will and Kate better drag themselves out of the English countryside and step it up a notch. I really have got to do a better job keeping tabs on these guys.